Own a piece of The Wizard of Oz! 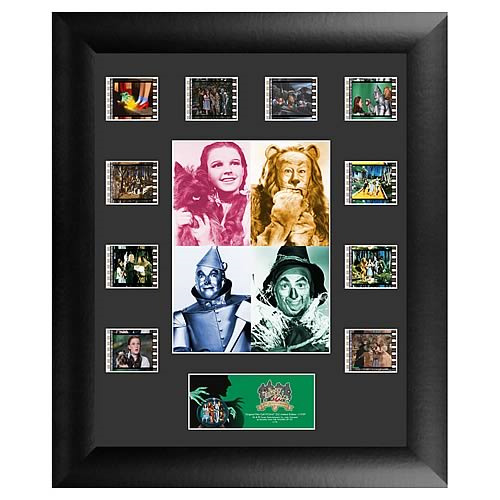 Features Dorothy, Scarecrow, Tin Man and Cowardly Lion, beautifully mounted and framed! A must-have, special edition collectible! This amazing film cell features prints and actual cells from The Wizard of Oz. Measures 13-inches tall x 11-inches wide. Perfect for displaying in your home or at the office, all the elements are framed in black wood and includes a certificate of authenticity. In this classic musical fantasy, Judy Garland stars as Dorothy Gale. Dorothys dream comes true when she, her dog, Toto, and her familys house are transported by a tornado to a bright and magical world unlike anything she has seen before. Unfortunately, she makes a mortal enemy of a Wicked Witch when the house falls on the hags sister. Now befriended by a Scarecrow without a brain, a Tin Man with no heart and a Cowardly Lion (and protected by a pair of enchanted Ruby Slippers), Dorothy sets off along a Yellow Brick Road for the Emerald City to beseech the all-powerful Wizard of Oz for his help to return home.